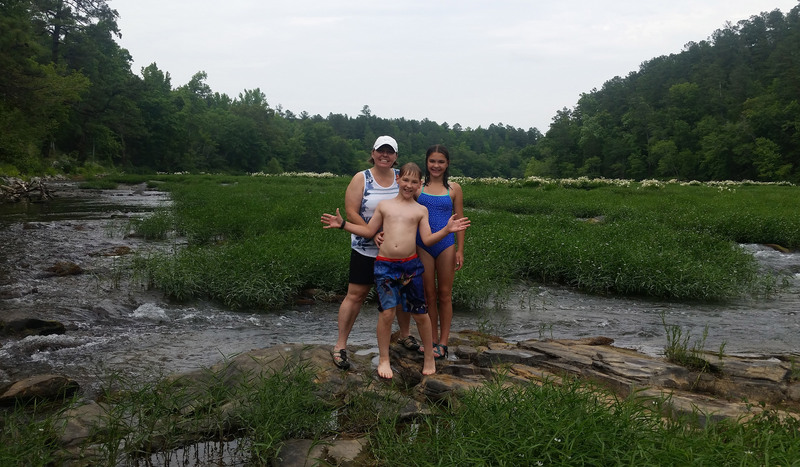 Kristine and the kids out on the shoals in the Cahaba River National Wildlife Refuge outside West Blocton. I met them there 150+ miles into the ride. It was great to cool off and swim with them in the river amongst all the Cahaba River Lilies! The Cahaba River is the “longest free-flowing river in Alabama and is among the most scenic and biologically diverse rivers in the United States” according to Wikipedia. I grew up not too far from the Cahaba River, purchased my first bike from River Oaks Cycles in Riverchase, played golf on a golf course with several holes on the Cahaba River (Altadena Valley Country Club), went to the dentist in Cahaba Heights, and more recently have lived within a mile of the river for the past 11 years, with my son playing baseball and my daughter playing lacrosse at Hoover East on the banks of the Cahaba (and sometimes underneath the Cahaba during floods). All of that is to say, the Cahaba River has been part of my life for nearly my entire life. To be able to share it with my beautiful wife and kids is beyond amazing. 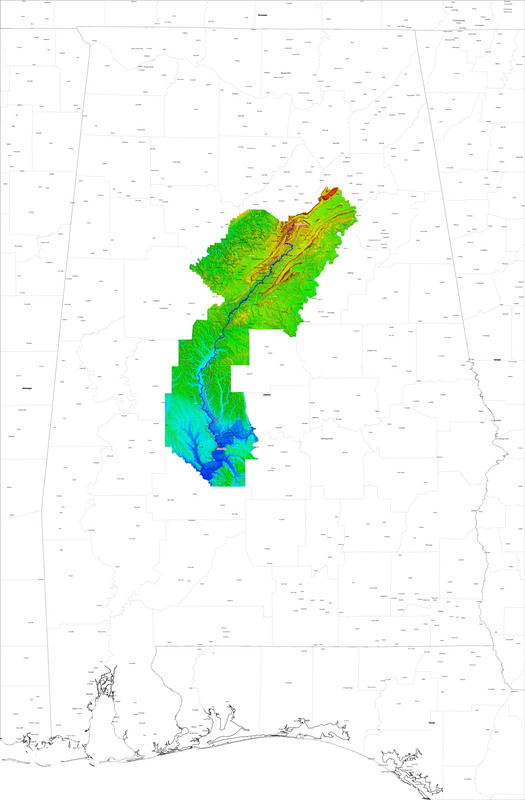 It’s easy to see why the Cahaba River is called the “Heart River” of Alabama as it starts and ends in the middle of the state, but not before traversing 194 miles and six counties. Click to enlarge and see detail. 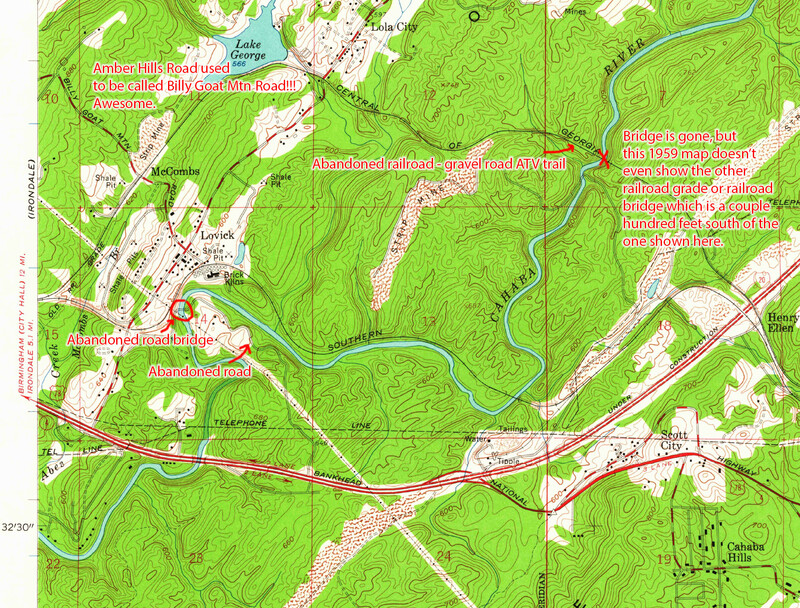 The Cahaba River is shown in blue below, and the 242 mile route I followed is shown in red. In addition to all that, there is the potential to see the following animals: foxes, coyotes, rabbits, deer, raccoons, possums, armadillos, turkeys, snakes, alligators (unlikely but possible), fish (we ford the river twice), turtles, all kinds of birds including hawks and owls, dogs (although this route traverses some of the most “dog-free” parts of Alabama I’ve ridden in – the dog per mile ratio is pretty low – in other words, it ain’t no blount county). Don’t let this list scare you, though, because the entire ride is either road-bikeable or hike-a-bikeable (speedplay pedals recommended only with the new walkable cleats and plugs) as long as you have good 25cm tires on your bike. The opening loop out of Trussville includes one of the steepest climbs in Alabama, so carbon wheels may be problematic on the descent. I tried to do the descent with rear brake only because my front brake was squealing really loudly and ended up damaging the wheel coming down Cahaba Mountain from excessive braking, so that is something to consider when making wheel selection. But other than that one descent, carbon wheels are fine for the entire ride as long as you are gentle on the gravel and pick good lines. I had no flats on my initial exploratory attempt at this ride – spoiler alert – I had to cut out bridges at the end because of wheel problems early on. Also, this ride should be a family event. There is so much to explore on the route, you could actually beat your family down to the finish if they stop and explore everything. Or they could meet you at a few spots and you could hang out with them like we did on Friday. Here’s a run-down of how Friday went. I set my alarm for 11:30PM and was out the door by 12:12AM with a tight schedule to try to make it down to Cahawba by sunset. Everything went well as I rode the 22 miles from my house north to Trussville on mostly deserted roads. I made it to the Trussville Cahaba Cycles by 1:30AM. This is where I’m thinking of staging the event, although I haven’t run anything by Cahaba Cycles yet since it’s a year away. I think 1:30AM is a good starting time for the opening 40 mile loop (Section 1) which takes us out to the source of the Cahaba on Cahaba Mountain. Even with my wheel problems, I made it back to Trussville by 4:30AM. Two of the bridges on this section were behind closed gates so unless we are very lucky I don’t think those will be accessible. This section included one spillway (echo lake), two brand new pedestrian bridges over the Cahaba, the rail shimmy bridge to get back to a third pedestrian bridge (abandoned) in Camp Coleman, as well as several regular road bridges. I called Kristine to let her know about my wheel problems as I left Camp Coleman. It was 4:30 in the morning, and we brainstormed options for resolving my wheel problems. We settled on her bringing me a replacement wheel along with the cassette tools so I could swap out the 32T cassette. My basement is a bit disorganized so in the process of collecting all the stuff I needed, she forgot the wheel itself. We didn’t discover this until she made it to the Waffle House where I was waiting for her. Undeterred, she drove me home where I swapped out everything for the wheel and then drove me all the way back out to Trussville so I could resume riding at the same spot. My wife is amazing, absolutely amazing. By this point, though, it was 6AM. I resumed the route and headed out on the second section of the ride. I left Trussville and headed out Roper Rd towards the St. Clair county portion of the Cahaba. There is one bridge, and a short 4 or 5 mile loop on Annie Lee and Acmar that takes you over a feeder river labeled “Cahaba River” on Google maps, but I’m pretty sure that is a mistake as it is not the main Cahaba River. Still, it is a major tributary so I’m including it on the Cahaba 400K route. After my wheel problems earlier, I decided to cut this whole loop out and regain 20-30 minutes of time lost earlier. One of the reasons I had called Kristine instead of trying to make it all the way back to my house with the broken wheel is that this next 40 mile section from Trussville to Mountain Brook is the most technically challenging of the entire ride with several miles of ATV trails, one fording of the river, one long abandoned road bridge, and one hike-a-bike through what I call “snake alley” although to be fair I haven’t seen any snakes there yet. 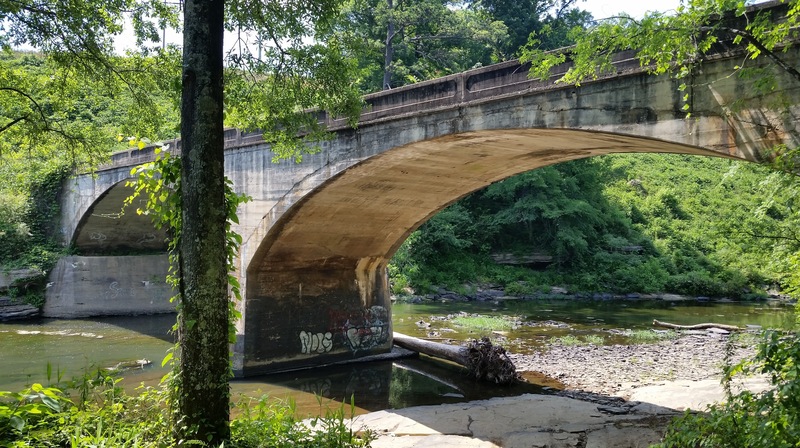 It also has some railroad history that I would love to explore some day as there are not one, but two different abandoned (only the supports are left) railroad bridges side by side over the Cahaba on this section. I was hoping to find the abandoned road that leads to the abandoned bridge, but it went through a dense forest with tons of treefall. Apparently the ATVs prefer the super steep powerline trail, so nobody has gotten back there to clear out the trees on the old road grade. I think this may have been US Hwy 78 many, many years ago. Evidence for this is the following 1959 USGS map which has been digitized and is available on store.usgs.gov – the historical maps are awesome, but for this section they only go back as far as 1959 and Hwy 78 had already been built. It does show three houses and a road at the spot where the abandoned Cahaba River bridge is. This is a substantial bridge costing a ton of money to build, so I imagine it had to have been a major road at one time. Abandoned road bridge over the Cahaba. As far as I know, it’s the only road bridge that is abandoned on the upper section of the Cahaba. All the other abandoned bridges are either pedestrian or railroad bridges. On the lower section of the Cahaba, the Co Rd 29 bridge appears to have been abandoned recently. 1959 digitized historical USGS map annotated to show abandoned railroad bridges and abandoned road bridge over the Cahaba River. This next 27 mile section goes through Mountain Brook, Vestavia Hills, Hoover, Pelham, and Helena – hence the name “Suburbia”. Don’t let the name fool you, though, as some of the coolest features are on this section: three steep canoe landings, one crossing underneath three bridges over the Cahaba, one high pedestrian bridge (Hoover East), a 200 foot grassy dropoff that is rideable (Healthsouth Helicopter dropoff), a quarry, and finally riding out into Buck Creek. There is also a Cat 3 climb from river level. On this ride I did the Karl Daly climb and descended Grants Mill, but I would prefer to do the Grants Mill climb and descend Belmont for the Cahaba 400K next year as you can start the Grants Mill climb from literally in the river. 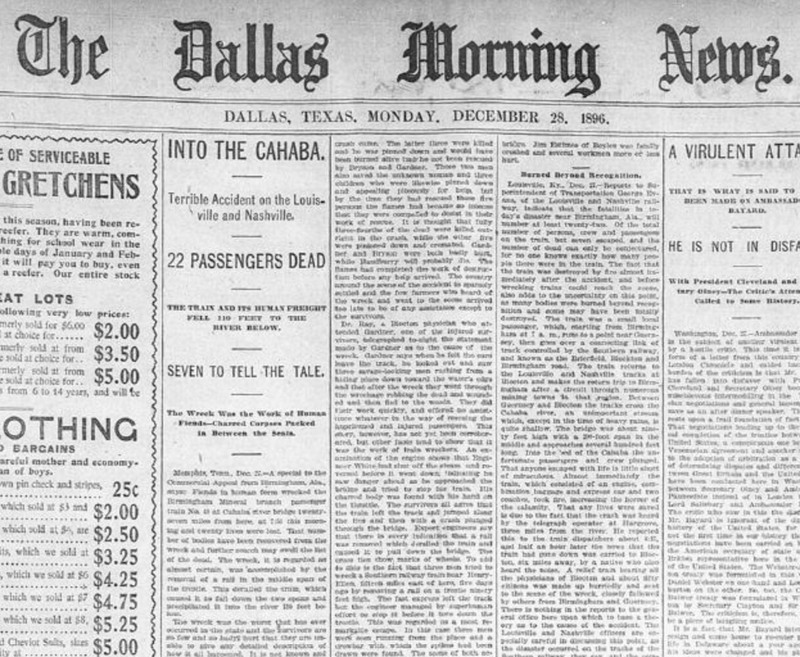 Dec 28, 1896 Dallas Morning News frontpage coverage of the fatal Cahaba train wreck. 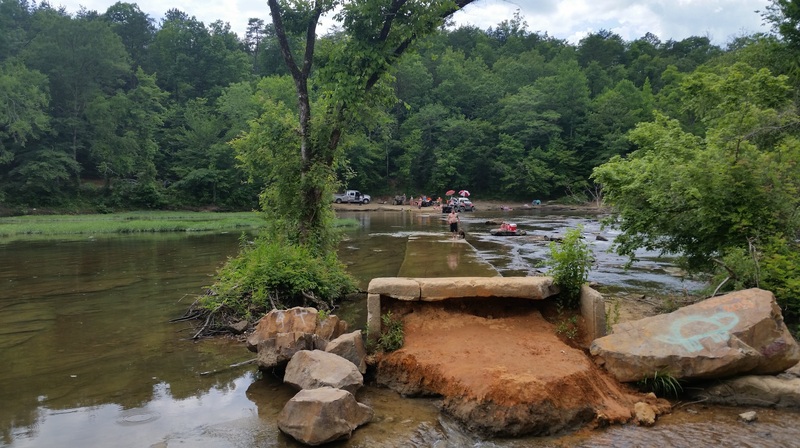 Michael Staley and I rode out to the Old Slab again on Memorial Day, and the place was pretty well packed with a lot of people enjoying the river from the surrounding communities of Pea Ridge and Green Pond. Memorial Day at the Old Slab – pretty crowded! Past the Old Slab is the Cahaba National Wildlife Refuge. I had a blast swimming with the kids out to the lilies and cooling off in the river. Kristine later took the kids hiking to the lily overlook while I headed on towards Centreville and the next major attraction – the Cahaba Lookout firetower. 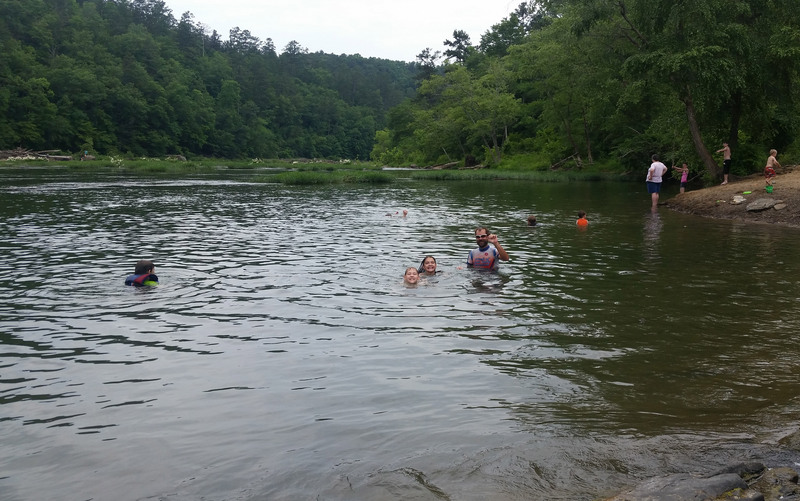 Swimming with the kids in the Cahaba River at the Cahaba River Naitonal Wildlife Refuge outside West Blocton. These two… top notch adventurers on a LONG day of #epicToone exploring. After 1.3miles, we found this fantastic overlook with a view of the shoals and lilies where we had played earlier. From West Blocton, the route turns south heading to AL-25 and Centreville crossing the Cahaba in two places – the US Hwy 82 bridge and the older bridge near Centreville high school. Centreville is significant for a number of reasons, but as far as the Cahaba goes, it is near the northern extent of alligator sightings. Closer down to the Alabama river, though, they are seen on a more regular basis. 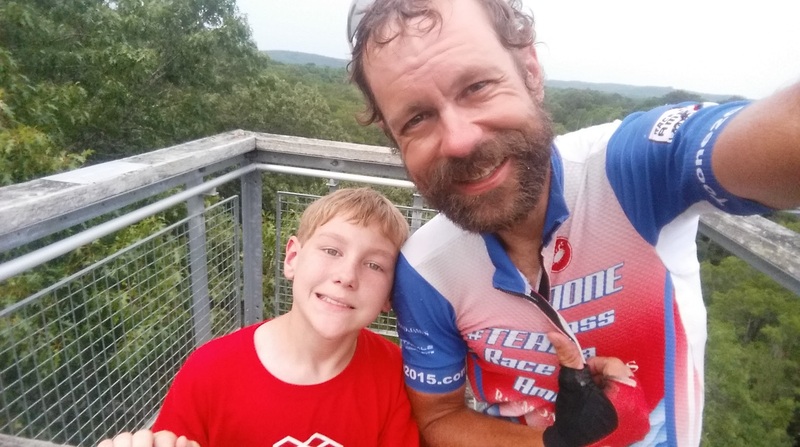 For me, the highlight of this section is the Cahaba Lookout tower, an abandoned (but still maintained) fire tower at the top of a ridge overlooking the Cahaba River valley and numerous other ridges and hills. I told @ktoone to stay on the main dirt road. I think I'm going to wait right here as she actually needs to go left here. I had left Kristine at the NWR to go hiking with the kids, and so I reached the fire tower dirt road ahead of them and was giving her directions to find the tower. It essentially is “follow the main dirt road”, but there is one split where the main road looks like it goes to the right, when in fact the county road (CR 51) is the left split – see instagram pic above. My family at the Cahaba Lookout Tower. Epic. 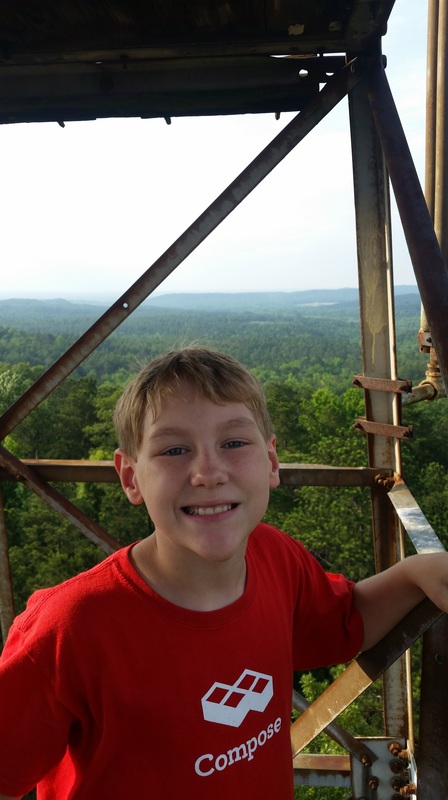 Josiah at the top of the Cahaba Lookout Tower. The house with cleared area around it in the background is adjacent to Co Rd 51, which is the climb to get up to this tower. The gap in the ridge behind Josiah’s head is the Harrisberg Rd to get to the Harrisberg bridge over the Cahaba. This 27 mile section goes from the fire tower to the birding tower. It veers north first on some dirt roads to reach the Jericho bridge and then back south to hit the birding tower. From the fire tower to the end, there aren’t as many bridges over the Cahaba because of how wide the river has grown and how wide the marshy areas extend on either side of the river. Since I was running really far behind schedule and still wanted to make it to the end, I decided to cut out the Jericho bridge and head straight down to Sprott (downhill and fast) to pick up the Cahaba at its big flood plain next to AL-14. 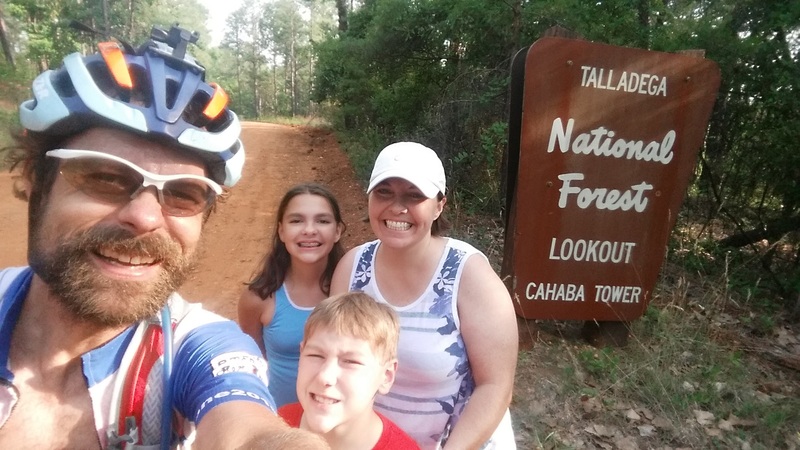 I stopped my Garmin there and hopped in the car with Kristine and the kids to cross the Cahaba on the AL-14 bridge and head back north to the birding tower on the opposite side of the Cahaba from Sprott. Since this section would have been 10 miles there and 10 miles back again, this saved us close to an hour. The birding tower is pretty cool, but the access to it is just as cool. You head down this gravel road with cool side trails such as “Devil’s Walking Stick Trail” until you reach the Secret Lake trail. One of the reasons it is a “Secret Lake” is because it is actually a swamp with huge trees growing up out of the water making it practically invisible from satellite or plane. The first bridge you cross on the hike is a covered suspension bridge. Then you take a bridge out over the edge of the swamp to reach the birding tower itself. Even from 100 feet up, you are not above the highest trees but you do have a good view. Also, there aren’t birds – but that could be because of the time of day and how much noise we were making. Josiah and I at the top of the 100 ft tall birding tower. Note how the tree behind us is even taller! This last section is flat and fast for the first half, but then quite hilly towards the end as you hit bluffs from both the Cahaba River and the Alabama River. I stayed on AL-14 skipping the Co Rd 6 bridge over the Cahaba and the abandoned Co Rd 29 bridge. I took the US-80 bridge and then headed south on Co Rd 45 to Co Rd 189, a fun road that starts out as dirt and then turns into this really fun pavement to ride because it has ruts and jumps, but the pavement itself is still very smooth. At the end of this road is short jaunt over the final Cahaba River bridge on AL-22 just outside of Selma and then the newly repaved Co Rd 9 to take you down to Cahaba Rd and the finish at the ghost town of Cahawba (the original capital of Alabama). Just made it – rode the entire length of the Cahaba River from its source north of Trussville to its confluence with the Alabama River at the original capital of Alabama – Cahawba. This entry was posted in Adventure, Training and tagged cahaba, epic, long, ultra on May 31, 2016 by kartoone.